Each year Flushing Presbyterian Church works with the Flushing Christian Outreach Center and other local churches to help local families have a happy Thanksgiving. Each church is asked to provide a specific food for the Thanksgiving boxes and to make donations for the purchase of turkeys. Collecting 600 cans of vegetables might seem overwhelming. It seems like a relatively easy challenge for Flushing Presbyterian Church. We have collected the 600 cans needed for the Thanksgiving boxes for the past few years and even had extra cans to donate to the Flushing Christian Outreach Center. 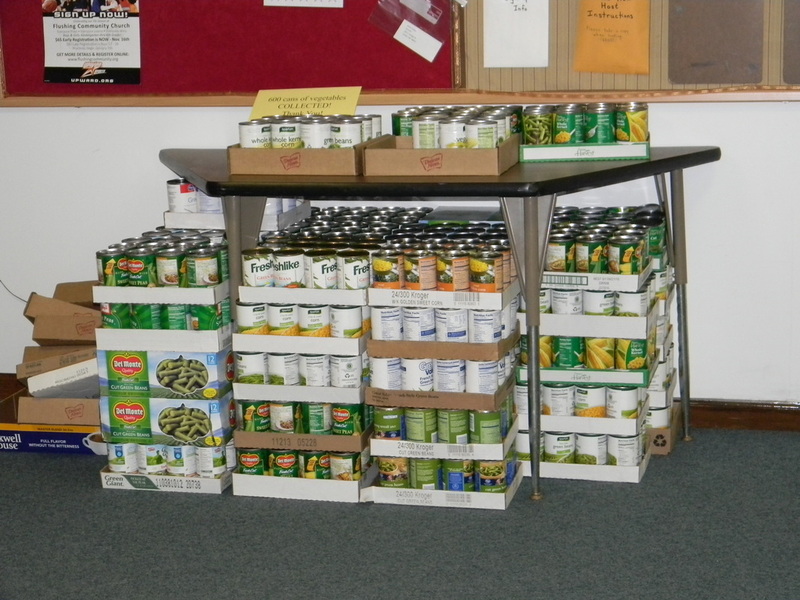 The cans accumulate in our narthex during the weeks leading up to Thanksgiving. Our youth group helps load them up for transport to the Flushing Community Church of the Nazarene, where the participating churches gather to assemble the boxes. The Flushing area churches assemble a total of 300 Thanksgiving boxes. 300 families, all in Flushing, will be receive the boxes of food for their Thanksgiving Dinner. The box includes, a Turkey, Potato's, vegetables, cranberries, fruit, stuffing, brownies, dinner rolls. Seven, or so, Flushing churches and several area businesses provide all the food. Assembling 300 Thanksgiving boxes of food is no small task. Participating churches gather at the Flushing Community Church of the Nazarene the Sunday before Thanksgiving to assemble them. The youth group from Flushing Presbyterian join in to help out. The pictures below are from the 2013 box assembly.